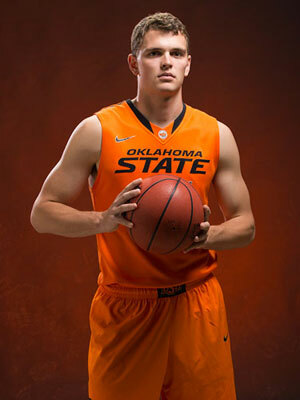 Christien Sage of Oklahoma State. One pick Cosmo got right. He kinda reminds me of Austin Nichols in this picture. As a lazy lady lately (whoa, alliteration! ), I’ve been a total slacker about scouting new hotties to show you dedicated readers. I’ve been very anti-sports watching lately (aside from my favorite teams), so I’m completely unaware of fresh meat. With the NCAA Tournament upon us, there is plenty of fresh meat awaiting our ogling eyes. There is always that hot college boy that makes you feel like a pervy old lady. With that said, Cosmo has been busy covering the sports world again, compiling a list of NCAA hotties to watch. I’ll let you be the judge, but here’s my 2 cents. H/T to Your Nation's Capital over at Japer's Rink for the image. She put all the pretty hearts around my two favorite Russians: Alex Ovechkin and Alex Semin! Sometimes there is one person that can make you feel all warm and fuzzy inside. It could be a spouse or significant other. Sometimes it’s a crush or a close friend…and sometimes it’s a teammate. So in honor of Valentine’s Day and teammate love, I bring you some of the best sports bromances! Follow me after the jump to see if your favorite duo made the cut! Over the last few weekends, Nike has been previewing their latest attempt to “improve” athletic apparel on several premiere NCAA Division I (yeah, that’s what I still call it) football programs. 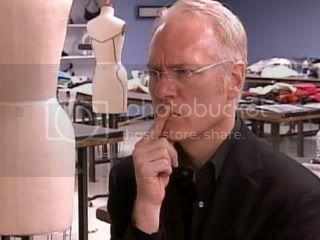 Now, perhaps these uniforms, designed to be ultra light and form fitting, are functionally a worthy advance, but from a sartorial viewpoint, well, my inner Tim Gunn was making this face. A lot. A brief survey of some of Nike’s designs after the jump. 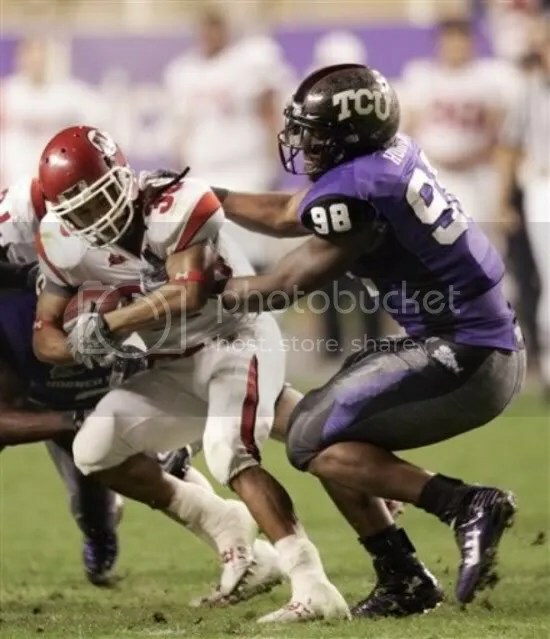 TCU's Jerry Hughes would like a word with you. It’s kind of weird to be an alum of a “football school” in a year when said school is …not that good at football, or at least not as good as we usually are. For the first time in a while, no amount of computer poll weirdness, upsets, or bizarre tiebreakers are going to get my Sooners in a BCS bowl. And we’re not the only ones in this boat (Hi, USC!). As of this week (and for most of the season, really), the top contenders for the BCS Championship game are Texas (hate, for obvious reasons), Florida (hate, for last year), and Alabama (hate, for Nick Saban). So I thought I’d look at the “underdogs” still in BCS contention — underdogs here not necessarily meaning a non BCS conference school, but a team that isn’t (or hasn’t been in the BCS era) a football power. 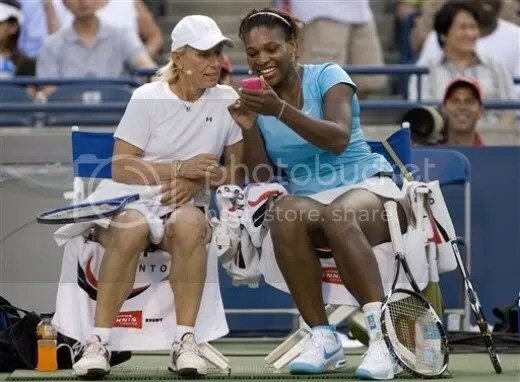 And of course, there are pictures. When it comes to being a sports fan, I have ridden the roller coaster of emotions. I have been privileged to experience the ultimate highs and humbled to have experienced the extreme lows. Recently, I’ve been forced to take inventory of my sports emotions, so to speak. 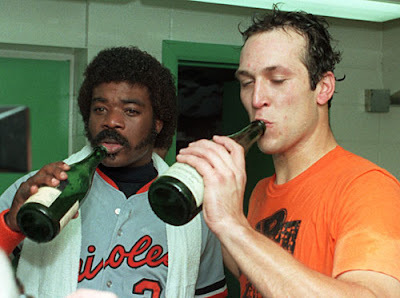 As most of you already know, I was born and raised in Baltimore in the early 80s. My first sports love was the Baltimore Orioles. When I was a little over 1-year-old, my O’s won the World Series. That was the last time my beloved franchise was blessed with a title. Of course, I don’t remember the sweet taste of victory, but I did experience it. My mom-mom packed up my little self, hopped on a bus and took me downtown for the victory parade. I have a photo of me in my little stroller, waving my World Series pennant with the parade passing in the background. What I wouldn’t give to recreate that moment. Let’s just hope I don’t have to wait until that stroller turns into a wheelchair! Let’s not forget that until I was a sophomore in college, I had never seen a baseball game that didn’t have Cal Ripken, Jr. playing in it. I wouldn’t say that the Orioles spoiled me, though. We were good during my formative sports fan years, but all good things must come to an end. Personally, I don’t think we’ll ever win until someone finally exacts revenge on that Jeffrey Maier kid. Hate him. While I have come to expect disappointment from the Orioles, I’m having a harder time coming to terms with my other teams. So this crazy football game happened. If you missed it, basically Miami and Florida State went back and forth and Miami came back in the final moments and took the lead. Da U won 38-34. I hate both teams. Despise them. Like really, the only way for me to win this game as a fan was if both teams lost. But hey, watching FSU isn’t the worst thing in the world with the guy they have under center. Christian Ponder is totally cute, right? It’s not just me? Help me decide.